Most people don’t realize how their central air conditioner actually works. They think that an air conditioner functions by pumping cool air into their home. But your air conditioner actually removes warm air and recirculates it as cool air. An air conditioner is basically a refrigerator. It uses the evaporation of a refrigerant, like Freon, to provide cooling. A central air conditioning system includes both the cooling and heating of air and cleans the air as well as controls the moisture level. There are a number of ways you can cool your home, but with any central air conditioning system the basics are the same; you will have a method of removing warm air to create cool air, a way to distribute the air to all of the rooms in your home, typically your duct system, and a way to control or regulate your system (thermostat). The first component of your air conditioning system is temperature control. When the air temperature rises above a preset level on your thermostat, the thermostat sends a signal to the air conditioner. This signals the air conditioner that it is time to turn on. The compressor (which is controlled by the thermostat) is the “heart” of the system. The compressor acts as the pump, causing the refrigerant to flow through the system. Its job is to draw in a low-pressure, low-temperature, refrigerant in a gaseous state and by compressing this gas, raise the pressure and temperature of the refrigerant. This high-pressure, high-temperature gas then flows to the condenser coil. The condenser coil is a series of piping with a fan that draws outside air across the coil. As the refrigerant passes through the condenser coil and the cooler outside air passes across the coil, the air absorbs heat from the refrigerant, which causes the refrigerant to condense from a gas to a liquid state. The high-pressure, high-temperature liquid then reaches the expansion valve. The expansion valve is the “brain” of the system. By sensing the temperature of the evaporator, or cooling coil, it allows liquid to pass through a very small opening, which causes the refrigerant to expand to a low-pressure, low-temperature gas. This “cold” refrigerant flows to the evaporator. The evaporator coil is a series of piping connected to a furnace or air handler that blows indoor air across it, causing the coil to absorb heat from the air. The cooled air is then delivered to the house through ducting. The refrigerant then flows back to the compressor where the cycle starts over again. Most central air conditioning units operate by means of a split system. That is, they consist of a “hot” side, or the condensing unit—including the condensing coil, the compressor and the fan—which is situated outside your home, and a “cold” side that is located inside your home. The cold side consists of an expansion valve and a cold coil, and it is usually part of your furnace or some type of air handler. The furnace blows air through an evaporator coil, which cools the air. Then this cool air is routed throughout your home by means of a series of air ducts. Heat pumps and geothermal systems are other options for cooling your home. The basic principle of removing warm air and replacing it with cool air applies to these systems as well. It is important to understand how air conditioning systems are rated for efficiency. They are rated by what is known as S.E.E.R., Seasonal Energy Efficiency Rating. Air conditioners with a higher SEER are more efficient, less costly to operate and more environmentally friendly. The current government minimum is 13 SEER. 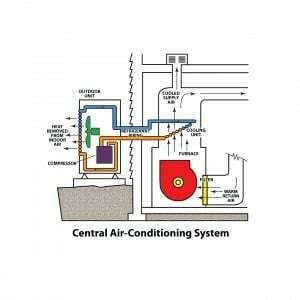 So those are the basics of your cooling system, the thermostat for control, the central air conditioning unit to remove warm air in order to create cool air, and a duct system to move the air through your home. And that how your central air conditioning system keeps you cool!